Do I need a credit card to sign up for an account? No. We do not collect credit card information when you sign up for an account. Enter it when you're ready to start your subscription. Enter your credit card information and you'll be ready to go. If you decide goCrop is not for you there's no need to cancel anything. Your account becomes inactive, but your data remains intact in case you decide to purchase at a later time. or call us at (802) 524-4480 ext. 466 in the US & Canada. We'd be happy to chat with you. goCrop was created by the University of Vermont Extension to assist busy farmers in creating and maintaining Nutrient Management Plans. Read More. 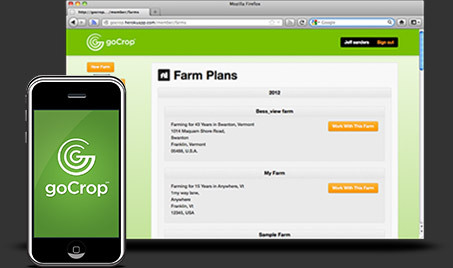 With goCrop, your farm data is stored securely and privately. You have full control over your information and who has access to it.